Made from durable, lightweight fiberglass reinforced plastic! Life-size Superman Statue stands 8-feet and 6-inches tall! Take your Superman collection to new heights. Get ready for flight with this larger than life Superman Statue! Standing an amazing 8-feet and 6-inches tall, this highly detailed statue features the Man of Steel preparing to take flight. With minimal assembly required, this life-size statue comes in 3 sections including a black round base with a collector's plaque, a lower body section, and an upper body section. 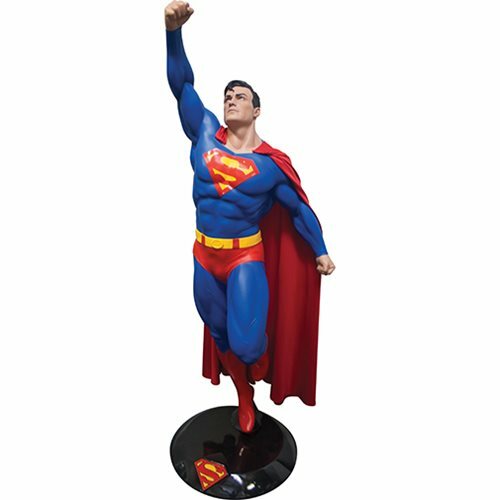 Complete with Rubies' deluxe quality cape, this Superman Taking Flight Life-Size Statue is made from made of fiberglass reinforced plastic.